At a cabinet meeting on Feb. 12, President Trump said the U.S. spends '$5 billion worth of protection' for South Korea. 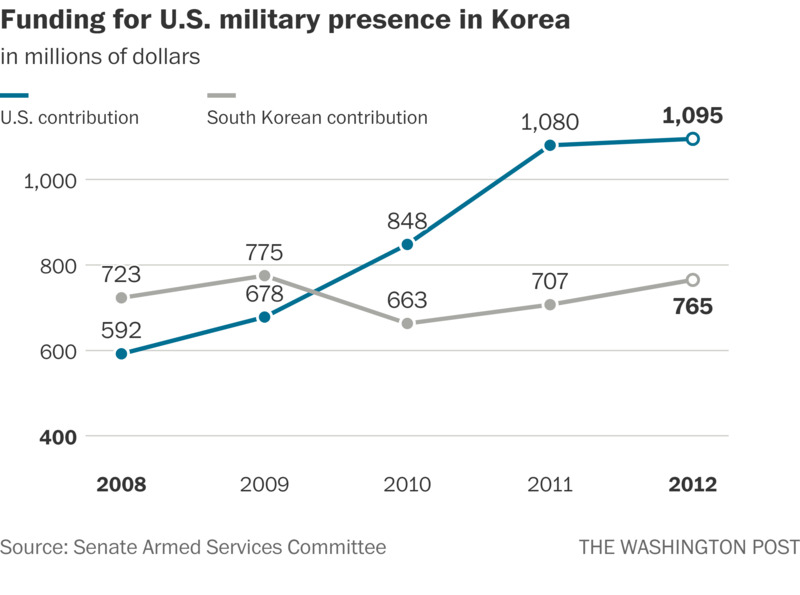 The United States does keep a large military presence in South Korea, spending hundreds of millions of dollars a year, but Trump’s figures are wildly inflated. Let’s dig in. The United States and South Korea signed a mutual defense treaty in 1953, after the United States led a United Nations force that helped repel an invasion from North Korea. U.S. troops have been stationed in South Korea for more than a half-century, and the two countries began to share costs under agreements dating to 1991. The American contingent in South Korea acts as “a vital security guarantor that helps to ensure that the more than 51 million Koreans and over 200,000 Americans living and working throughout South Korea are protected from real and present North Korean threats,” according to a 2018 report from U.S. Forces Korea. The 1953 defense arrangement “is central to both our strategic interests in the Asia Pacific and our ability to deal with the unpredictable and frequently aggressive behavior of the North Korean regime,” according to a 2013 report by the Senate Armed Services Committee. Notice a trend? The State Department, the U.S. military command in South Korea and the Senate Armed Services Committee describe the deal as mutually beneficial. The South Koreans get help defending their homeland; the United States gets to keep close tabs on a volatile region for its own strategic interests. Let’s take a closer look at Trump’s numbers. This is false. South Korea in 2018 paid the United States about $830 million under the burden-sharing agreement, covering approximately 40 percent of the cost of the U.S. deployment. So the total cost for the United States would be somewhere around $1.25 billion, not $5 billion. The U.S. share became greater than South Korea’s in 2010. The Defense Department, the White House and the South Korean Embassy in Washington did not respond to emailed questions about these costs. Trump is not alone in raising concerns about the cost-sharing agreement. The Senate committee’s report from 2013 noted that “contributions from the South Korean government … have not kept pace with U.S. costs” and questioned several projects on which the funds were being spent at the time. On the other hand, South Korea covered 90 percent of the cost of a new military base that came with a $10.8 billion price tag. It’s the largest U.S. military base overseas. The country has increased its defense spending at a faster rate than the United States over the past decade, reaching $39 billion in 2017, according to the Stockholm International Peace Research Institute. A Pentagon spokesman told us that the number is actually 28,500. That’s roughly what the Defense Department’s Defense Manpower Data Center reported as of December. The number was about the same the previous year. “There are roughly 28,000 service members in South Korea, deterring North Korean leader Kim Jong Un,” according to a Defense Department news release in December 2017. It’s ironic that the president, consumed as he is with denuclearizing North Korea, throws out demonstrably false numbers. These claims are all carelessly off target and worthy of a cumulative Four Pinocchios. Especially wild is Trump’s claim that the United States spends $5 billion a year defending South Korea, when it’s closer to $1.25 billion. 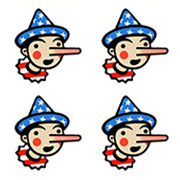 His boast that his administration negotiated an extra $500 million contribution with a couple of phone calls is just as false. South Korea is ponying up less than $100 million in extra funding this year. Less egregious but still noteworthy is Trump’s inflated figure for the number of U.S. troops in Korea. His own Defense Department told us it’s 28,500, not 40,000. Salvador Rizzo is a reporter for The Fact Checker. He previously covered New Jersey politics, courts, state finances and Gov. Chris Christie, with stints at the Star-Ledger, the Bergen Record and the Observer.